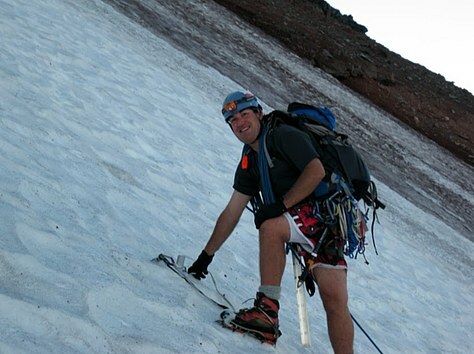 Meet Jim Paxinos, a Tacoma Mountaineer and education and leadership consultant who found pure support, understanding, and absolutely no judgment when learning to climb with The Mountaineers. When I moved to WA from Phoenix, AZ in 2010, I saw Rainier and said, "I've gotta climb that thing!" I've been climbing stuff since I was a baby, but had absolutely no snow/glacier climbing experience. I signed up for a guided climb, summited and that was it - I was hooked. I asked around at work if there was any such thing as "Mountaineer School," ha..ha. I was directed to The Mountaineers and here I am 5 years later, still as active as the first year I joined! The people and the views. The people I've met in the Mountaineers are incredible. Not only in personality and skill, they seem to have their life priorities in the right order - more so than any other group of individuals I've ever known. That influences me to do the same. As far as the view - I think you have to have lived in the desert for 40 years to fully understand what I experience when I gaze from a mountain top here in WA! Believe it or not, it's when I discovered I was NOT a natural rock climber during Intermediate. I really struggled with leading rock and mastering related rock climbing skills. Honestly, I was awful. What I remember most from that time wasn't what I couldn't do - it was how the instructors and fellow Intermediates reacted. Pure support, understanding and absolutely no judgment. Various climb leaders and fellow Intermediates offered to work with me individually outside of class and field trips until I finally got it dialed in. It was then I truly discovered the healthy culture of the Tacoma Mountaineers and character of its members! The mountains and my Mountaineers friends! Doing something I've never done before and never thought I could. Superpower? Mr. Freeze (I have an astonishing tolerance for the cold). Post-adventure meal of choice? Beer. If you could be a rock star at any outdoor activity overnight, what would it be? Ski jumping! Want your own adventure profile feature? Enter your information for a chance to be featured!